Below you can find a selection of neem home remedies for acne. Neem oil and neem leaf can be very beneficial for acne sufferers. You can buy them or you can make your own acne home remedies from the neem tree. Many herbalists recommend neem seed oil and neem products as some of the most efficient home acne treatments. Neem is a mild treatment that does not upset your skin further. Neem does not only kill the acne causing bacteria, it also soothes redness and inflammation. However, before you rush out and spend money on neem oil products I urge you to read this page about neem and acne. The key to successfully treating acne at home with neem products is to really understand acne in the first place. Neem oil is not a miracle cure. You still have to find the neem skin care products that are just right for you, and you still have to stick to a good skin care regime and make the appropriate lifestyle changes. Some people report that neem can lighten the color of the scars and make them less visible. Neem can lighten freckles and blemishes, and it can lighten and improve the look of scars, too. But please, especially when it comes to scars, don't expect miracles! 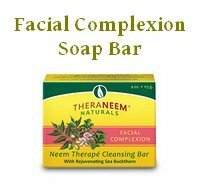 The most hassle free way to treat acne with neem is to source a mild neem soap and a light, oil-free moisturizer with neem. It's important that the soap is not too harsh. If it dries your skin too much the skin will react with producing even more oil than before. And it's the excessive oil production that causes the acne breakouts in the first place. Don't scrub, don't rub, just a gentle cleansing regime with products that contain either neem oil or neem leaf extract. The higher the neem concentration in the product, the better, of course. So read the labels and compare. Making your own neem home remedies is more work but you avoid any artificial ingredients that may upset your skin balance. If you already use the perfect cleanser and moisturizer you may not want to switch and risk making things worse. Here are some suggestions. For a more effective treatment soak the neem leaves in hot water until they soften. Now crush the neem leaves in the same water to make a paste. Also very effective is a paste made from neem leaves and turmeric. Boil neem leaves in water for a few minutes and strain. Then use the water to splash your skin several times a day. Carefully pat the skin dry after the treatment, don't rub. You can also add this tea or a more concentrated neem leaf extract to calamine powder or sandalwood powder to make a paste. 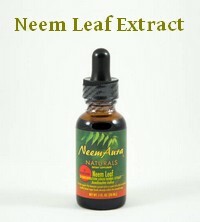 If you don't have access to fresh neem leaves buy dried neem leaf powder and use it to make a paste or tea. If you grow neem or live in an area where neem grows you can also use the skin/soft bark of the neem tree. Rub it on a rough surface with some water until you get a brown paste. 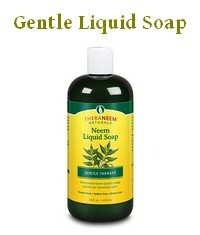 If you are into soap making you can make your own maximum strength neem oil soap. Source quality organic neem seed oil and use it at a concentration of about 20%, blended with other oils like for example olive, jojoba or avocado. And last but not least, you can add neem oil or neem leaf extract to the products you already use and that work for you. Add oil only to your cleaning products and use only the leaf extract in any moisturizers or lotions. Whatever you do, make sure you use the super mildest skin care products you can find. Neem can accomplish the same things that the harsh ingredients in conventional acne medications do. Benzoyl peroxide, salicylic acid... They're all likely to dry your skin too much or irritate it further. And who wouldn't love to avoid antibiotics if they can? 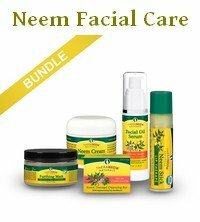 You can support your neem acne skin care regime by using neem internally. 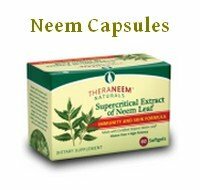 See the page about using neem capsules for acne for more information. Give Your Neem Acne Home Remedy A Chance To Work! Here are a few more things you should do. Avoid astringent facial products like toners. They are likely to dry out the skin and increase oil production. "Only printers and copy machines need toner." Avoid oil-based cosmetics. Even better, avoid any cosmetics. Eat healthy. Fresh fruit and vegetables DO make a difference. Certain foods can aggravate acne, but everybody reacts differently. Observe your skin and avoid foods that make you break out. Exercise! It increases the blood flow and gets more oxygen to your cells. This will make everything heal quicker and can make scars fade. The sweat also cleanses the pores from the inside out and prevent further outbreaks. Of course you should rinse your face clean after exercising! Neem home remedies for acne can be very efficient, but you have to give them a chance to work! 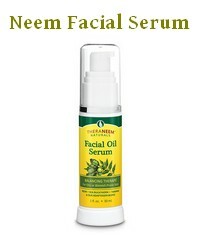 Please also read the main page about neem and acne.